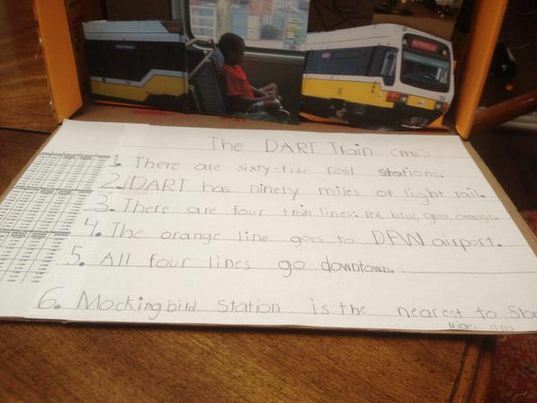 It was a natural fit when Stonewall Jackson Elementary School first-grader Nigel was assigned a project about the DART Rail opening as part of Stonewall Jackson Elementary School’s 75th anniversary celebration. 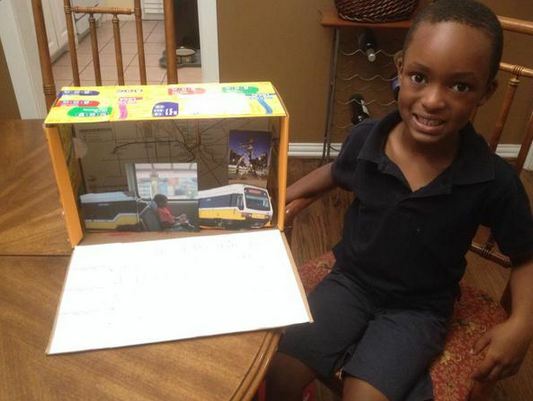 Nigel, who rides DART regularly with his family, chose to create a diorama about DART Rail showcasing passes, maps, pictures, facts and more. After initially posting the photos on Twitter, we caught up with Nigel’s mother, Sarah McDonald, to learn more about the project and the family’s interest in DART. To mark the school’s 75th anniversary, each grade level was assigned a decade and a specific thing from that decade on which to do a project. First grade was assigned the 90s, and Nigel was specifically assigned the opening of the DART trains! This was a PERFECT fit for our family given that we use DART on a daily basis to get to and from work and fun activities. He has been enamored with the trains since we moved to Texas in 2010. He knows pretty much all of the stops on each line in order. In fact, when my mom stayed with him for two weeks over the summer, he was her tour guide! Stonewall Jackson formally celebrated their 75th anniversary last week where all of the projects were on display. Thanks Nigel and Sarah for being such big fans! This entry was posted in DART Art, Other. Bookmark the permalink.